An introductory and intermediate level handbook written in pragmatic style to explain residual stresses and to provide straightforward guidance about practical measurement methods. Residual stresses play major roles in engineering structures, with highly beneficial effects when designed well, and catastrophic effects when ignored. With ever-increasing concern for product performance and reliability, there is an urgent need for a renewed assessment of traditional and modern measurement techniques. Success critically depends on being able to make the most practical and effective choice of measurement method for a given application. Practical Residual Stress Measurement Methods provides the reader with the information needed to understand key residual stress concepts and to make informed technical decisions about optimal choice of measurement technique. Each chapter, written by invited specialists, follows a focused and pragmatic format, with subsections describing the measurement principle, residual stress evaluation, practical measurement procedures, example applications, references and further reading. The chapter authors represent both international academia and industry. Each of them brings to their writing substantial hands-on experience and expertise in their chosen field. 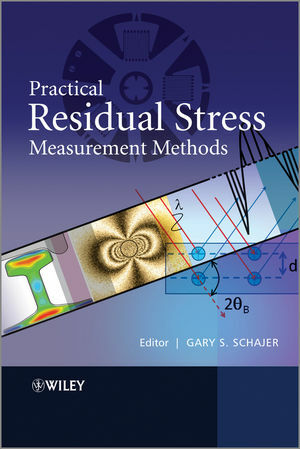 Fully illustrated throughout, the book provides a much-needed practical approach to residual stress measurements. The material presented is essential reading for industrial practitioners, academic researchers and interested students. Gary S. Schajer is Professor of Mechanical Engineering at the University of British Columbia, Vancouver, Canada. He received his doctorate from the University of California, at Berkeley and worked as a senior research engineer in industry before returning to academia. His research interests include hole-drilling measurements of residual stress and related inverse solutions, and he has been the recipient of numerous awards for teaching and research. Professor Schajer has written extensively in related journals and conference proceedings, and is currently the Associate Technical Editor of Experimental Mechanics.